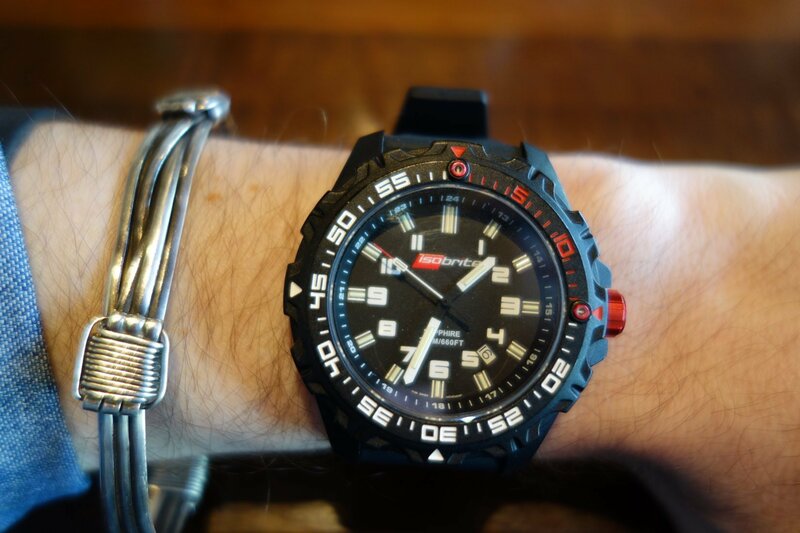 ArmourLite IsoBrite Hard-Use Tactical Watch/Diving Watch with T100 Tritium Illumination for Military and Law Enforcement Tactical Operations, Maritime Operations and Civilian Tactical Shooting (Video!) | DefenseReview.com (DR): An online tactical technology and military defense technology magazine with particular focus on the latest and greatest tactical firearms news (tactical gun news), tactical gear news and tactical shooting news. 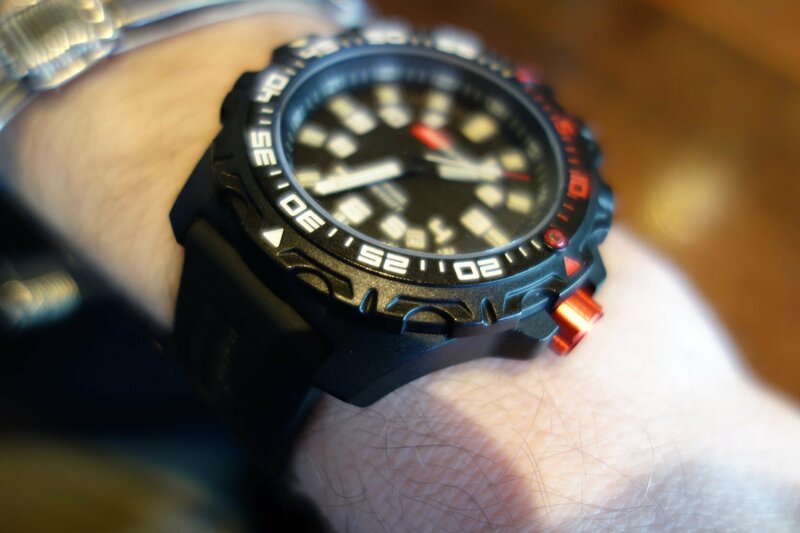 ArmourLite Watches recently introduced their new brand, IsoBrite hard-use tactical/diving watches, and they're pretty badass. 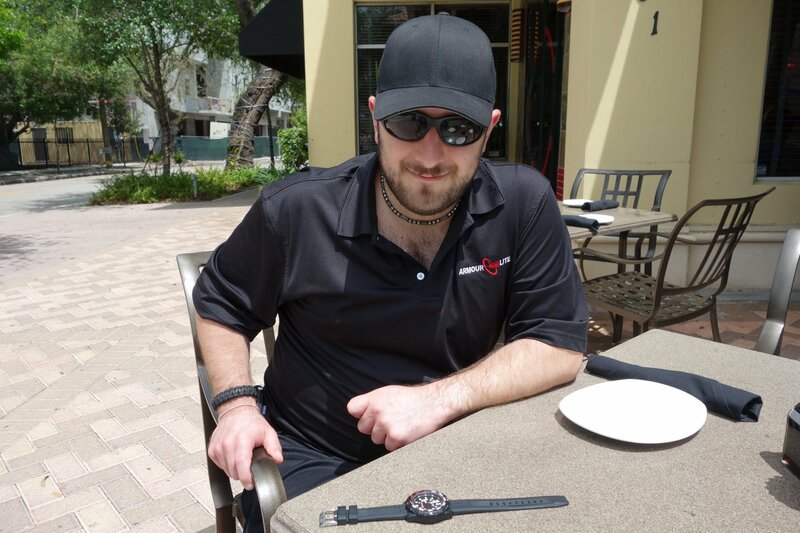 Basically, the new IsoBrite tactical watch DefenseReview (DR) handled and tried on in Miami was specifically developed for tactical operations and tactical shooting. As such, it's chock-full of cool features, including Swiss T100 tritium (H3) illumination on the number markers, hands and bezel, a Swiss Ronda normtech Caliber 715Li quartz movement, unidirectional polycarbon bezel, polycarbon case, and an "ultra-scratch-resistant" sapphire crystal. There's even an option for a left-sided crown if the customer wants one. Moving the crown to the left side (again, optional) means it won't interfere in any way with tactical shooting or other tasks while the assaulter/operator or shooter is using tactical gloves or performing any task that requres the wearer to bend his watch hand back. Did we mention that the IsoBrite tactical watch can also handle diving operations down to 200 meters (200m / 20 atm / 660 feet) and its battery lasts for 10 years? That's pretty good. No doubt, those are all great features that gel together to make a high-quality product, and you don't have to worry about dropping your IsoBrite watch in your pool. 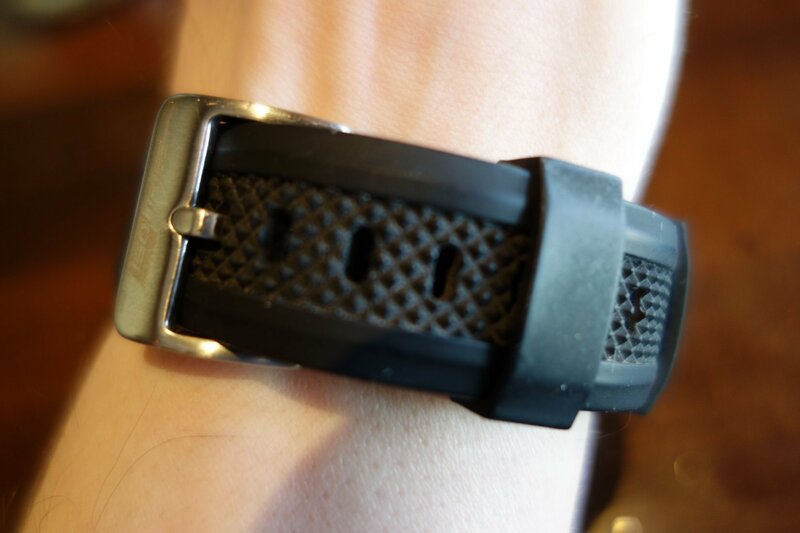 However, you can't fully appreciate this watch until you put it on and feel how lightweight and comfortable it is on your wrist, thanks to the lightweight polycarbon case and bezel, lightweight Swiss quartz movement, and the soft silicone watch band that feels like butter against your wrist. Frankly, DR couldn't believe how crazy-comfortable and lightweight the ArmourLite IsoBrite tactical watch felt for a hard-use analog-presentation diving/tactical watch when we strapped it on. It was a really pleasant revelation. The left-sided crown option should only serve to add to the wearer's comfort in certain situations. But the proof is in the performance. Defense Review hasn't yet had the opportunity to run one of these watches in the field or on the range, yet, but we hope to remedy that soon. If they perform as advertised, they're going to be winners. 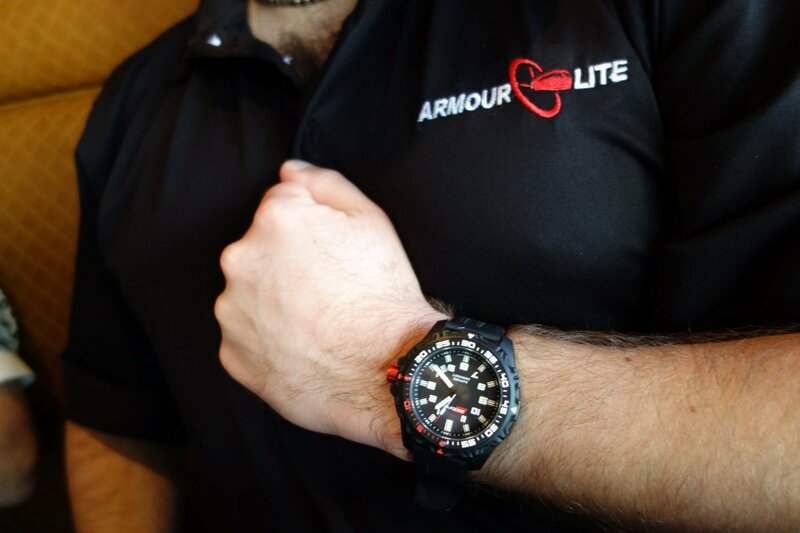 Specifically, we're most interested in running the just-released ArmourLite IsoBrite Eclipse tactical watch, which is an all-black model (including the crown, obviously). The IsoBrite watch we saw and photographed looked good, but we like the idea of the all-black Eclipse even better. We can't wait to get one. "Isobrite is the world's first T100 tritium illuminated lightweight polycarbon watch. The watch features a 10-year battery life, ultra scratch resistant sapphire crystal, two tritium markers on the unidirectional bezel, and 200m (20 atm / 660 feet) water resistance. Unlike ordinary tritium watches that use T25 tritium illumination, the Isobrite watch uses ultra bright T100 tritium illumination. This makes it 4 times brighter than the competition! The T100 tritium glass tubes are manufactured by Switzerland’s mb-microtec and are currently the brightest and most advanced tritium illumination available on the planet. 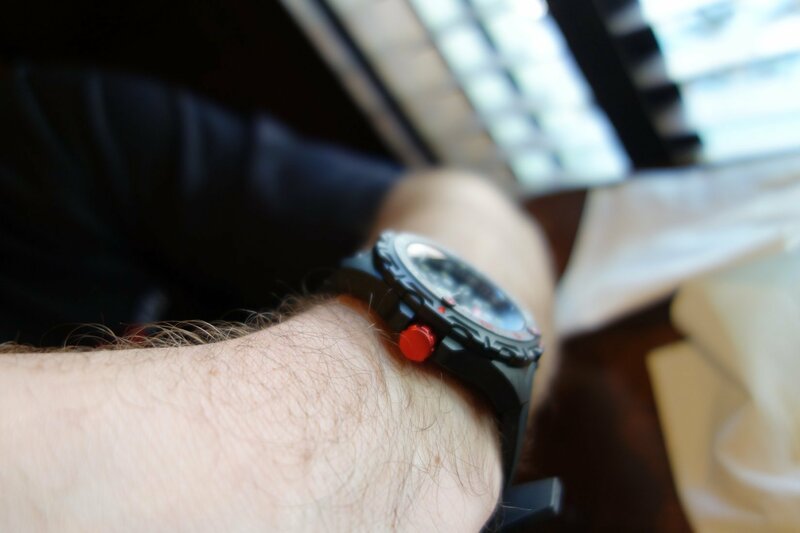 In addition, while most polycarbon watches use mineral crystals, ArmourLite made the Isobrite watch with an ultra scratch resistant sapphire crystal. Sapphire is the same crystal material used on high-end fine watches by Omega and Rolex. The 47mm wide and 12mm thick case is made from a carbon reinforced poly material which is exceedingly strong while being very lightweight. The back of the case is made of steel with four screws. The push-in crown is 4mm wide. 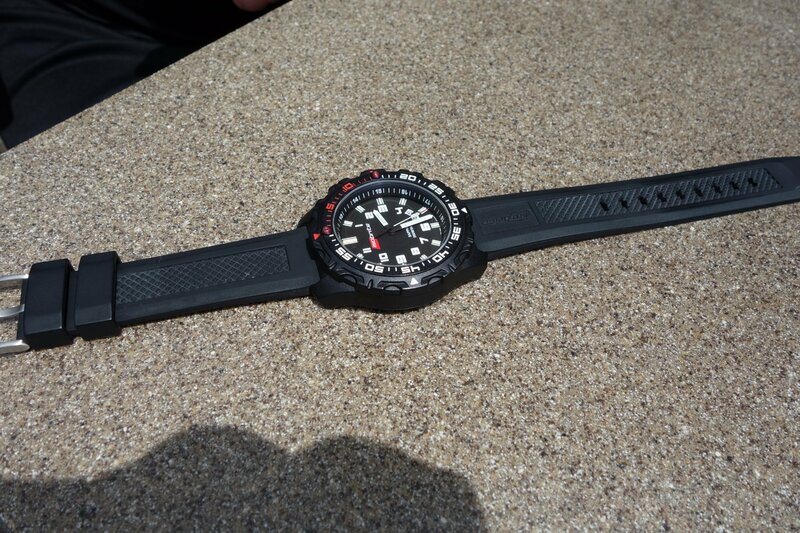 The case also features a unidirectional ratcheting bezel with two H3 tritium illumination markers. The Isobrite watch features a reliable Swiss Quartz Ronda 715Li movement with a 10-year lithium battery. The watch comes standard with a 22mm black silicone band with the Isobrite logo. The clasp is a steel buckle with the IsoBrite logo as well. 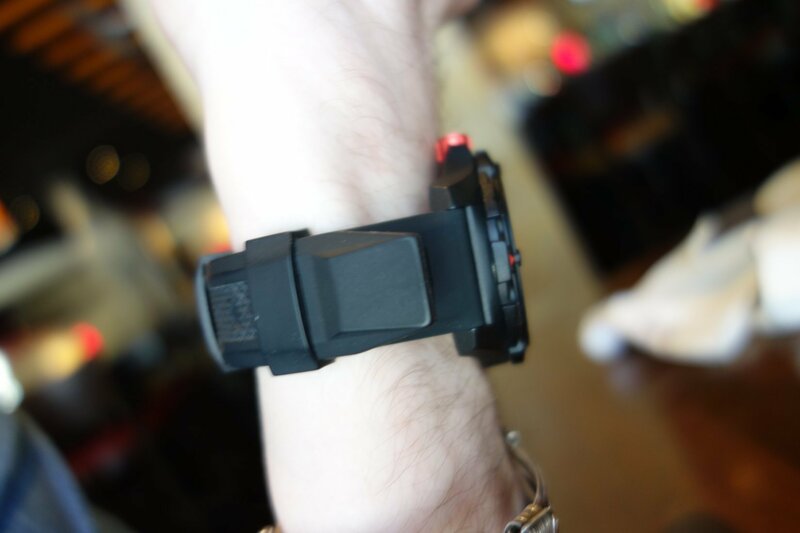 ArmourLite offers a 2-year international warranty on the Isobrite watch. 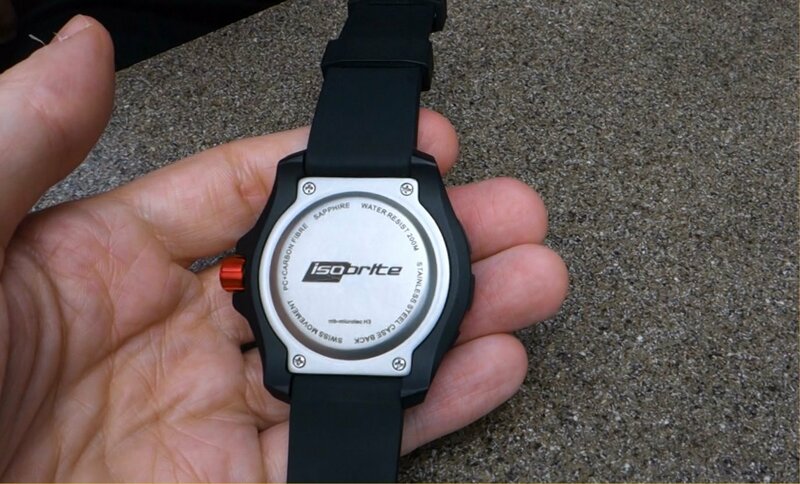 Because Isobrite is a polycarbon watch, it features a push crown instead of a screw crown. Please note that it is not necessary to have a screw crown to maintain water resistance. 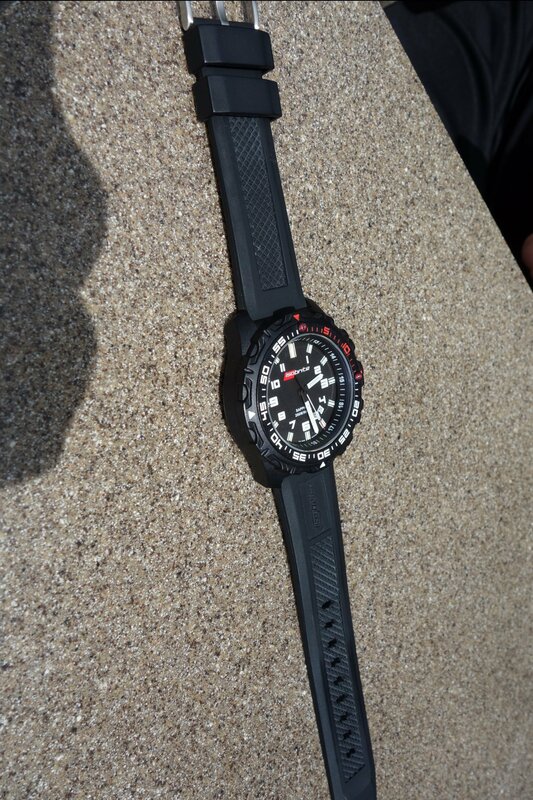 The watch features 200m (20 atm / 660 feet) water resistance.